These violins of flamed wood for back sides and neck, selected spruce top. Entirely hand made, good ebony trimmings. Light flamed maple, good quality spruce top, golden reddish‑brown shaded and slightly imitated. Viola: 15" - 16 ½" body lengths. 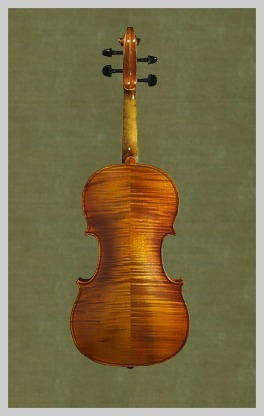 Flamed wood for back, neck and top, fine golden‑brown shaded and imitated. Better flamed back, choice spruce top, amber shading and slightly imitated. Viola: 15" - 16" body lengths. Well flamed mapel for back, sides and neck, fine grain spruce top, reddish‑brown varnish. Viola: 15 ½" - 16 ½" body lengths.